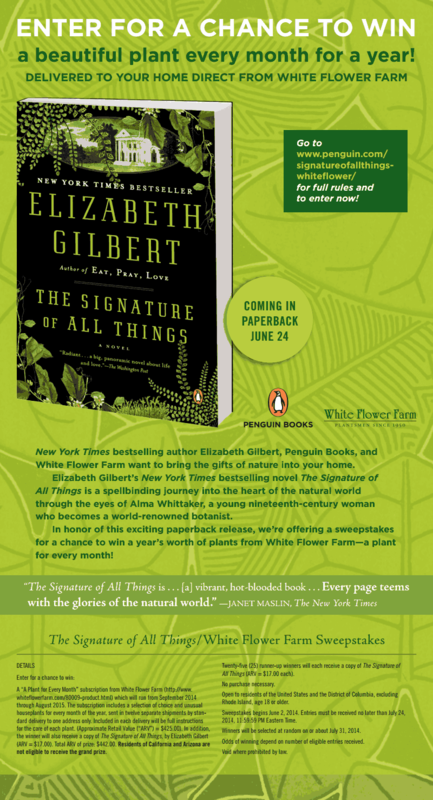 In celebration of the paperback release of THE SIGNATURE OF ALL THINGS—Elizabeth Gilbert’s NY Times bestselling novel of science, love, and the thirst for knowledge—Penguin is offering a sweepstakes for a chance to win a plant a moth for an entire year, courtesy of White Flower Farm. For full terms, conditions, and a chance to win, please visit here. Please note: contest ends July 24th! Q: After the stunning dual success of your memoirs Eat, Pray, Love and Committed, the safer, more obvious choice for you would have been to continue in nonfiction. What was it that prompted you to return to the novel with THE SIGNATURE OF ALL THINGS? A: I needed to come home to my roots as a writer. Fiction is where I began my writing journey, and all I ever wanted to be was a pure novelist. Fate intervened and led me into the world of memoir (and believe me, I am grateful for my success there!) but the next thing I knew, a dozen years had passed since I’d written a word of fiction. I simply couldn’t let another year go by, so I embarked on this novel. Q: How difficult is it for you to shift gears between genres? A: I thought it would be more difficult than it was. I feared I had lost the skill of fiction entirely (almost the way you can lose a foreign language if you don't practice it often) and so I was intimidated by the prospect of returning to the form of a novel. As a result of my fear, I over-prepared for this book ridiculously. I did ten times the research I actually needed, just to feel covered and safe. Up till the very day I put down the research and began actually writing the novel, I honestly wasn’t sure if I could do it. But as soon as I began, the moment Alma was born, I realized, “Oh! I was so wrong! Fiction isn’t a foreign language; it’s my mother tongue!” I had forgotten nothing, except the joy of it. It felt like a homecoming. 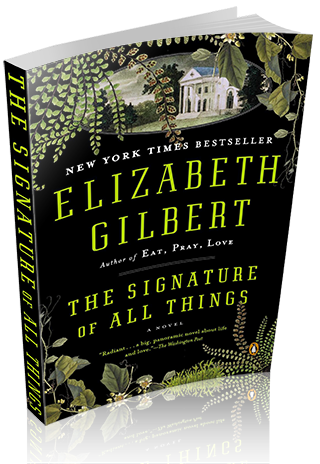 Q: THE SIGNATURE OF ALL THINGS opens in 1800 and spans much of the 19th century as its heroine Alma Whittaker comes into her own as an accomplished botanist. According to Kirkus Reviews, this “sweeping saga…offers an allegory for the great, rampant heart of the 19th century.” Why did you choose to set your novel during this particular time? And what aspects of this era are important for us to remember in modern times? A: The nineteenth century fascinated me because of its intellectual accessibility. I could never write a story about modern science because the comprehension of modern science is far out of reach to anyone except modern scientists (and each of them can only understand the specifics of their own narrow fields.). The nineteenth century was the last moment in history when a relatively educated layperson could follow what was going on in the world of science and invention to a wide degree. Also, there were no "professionals", such as we know them today. This was a time when amateur explorers, naturalists and enthusiasts were are still making major contributions to progress. Alma is a woman who would have been up-to-date on all the latest thinking in the world, across many different fields of study. With her own well-tended library, her private offices, and her brilliantly cultivated mind, she could easily have come up with botanical theories to rival those of any man. This idea of such open access to history-changing ideas fascinated me more than anything. That, and an inherent attraction to the gorgeous language of the day. With apologies to the Elizabethians, I think nobody ever wrote or spoke better English than during the nineteenth century. We could use a little more of that. Q: The mass popularity you achieved with Eat, Pray, Love has probably changed your definition of success. As you go forward, what does it mean to you now to succeed as a writer? THINGS without the beneficence of Eat, Pray, Love. That book has been my great enabler, my great patron. My notion of success now is simply to keep following my interests, wherever they may take me. Q: The novel’s story soars across the globe—from London, to Peru, to Philadelphia, to Tahiti, to Amsterdam and beyond. You are one of modern literature’s most famous travelers, from Italy, India and Indonesia in Eat, Pray, Love to Vietnam, Thailand and Cambodia in Committed, so readers will surely be looking forward to the armchair travel of THE SIGNATURE OF ALL THINGS. Can you discuss why you chose any of these particular settings for the story? Q: The epigraph of THE SIGNATURE OF ALL THINGS reads, “What life is, we know not. What life does, we know well.” That line is a bit of a riddle in itself. How do you think it comments on Alma Whittaker’s story? A: I think it’s such a lovely quote because it sheds light on the dilemma of all scientific inquiry. Life’s basic doings are fairly simple to decode. From careful observations, we have been able to figure out how systems like photosynthesis and cell regeneration and reproduction all function. That part is straightforward. But that still doesn’t tell us what life IS. Why are we here? Why do we have these extraordinarily over-evolved minds? Why do we long for the divine? Why do we suffer? Why do we feel that we have souls? Why are we moral or immoral? Why do we contradict and surprise ourselves so? Despite all our intellect, we are no closer to answering these questions than ever—as Alma, by the end of her journey, well realized. Q: The title of your novel alludes to a theory set forth by a sort of scientific mystic from the 1500s, Jacob Boehme, who argued that the entire natural world is a divine code, crafted and encrypted by God for the betterment of humankind. Boehme was a pretty weak scientist but a highly inspirational thinker. Why did you choose his phrase “the signature of all things” as the name of your novel? A: First of all, the phrase itself is simply beautiful. But I also felt that Boehme’s theory speaks to a common longing which unites scientists, the religious and the artistic—namely an urge to break the code, to look behind the veil, to be shown the secret answers. I feel as though all the main characters in the novel are, in their own ways, searching for the Signature of All Things. They don’t merely want some of the answers: they want THE answer. Q: Your book has much of the feel of a novel written in the nineteenth century. How, as a writer, did you go about establishing the authenticity of your novel’s mood? A: I completely immersed myself in nineteenth-century prose and ideas. Fortunately this was fun for me; I have always had a particular love for writers like Dickens, Trollope, Eliot, Austen, and James. I went back and re-read many of those great novels, and, of course, I also sought out as much information as I could on the botanical exploration and history of the day. But mostly I read letters—not only letters of great naturalists, but also the letters of common people. Those unguarded everyday letters are where I could best hear people’s common speech, and that helped me fall down the rabbit hole of time and language. Q: Henry Whittaker, your heroine’s father, dominates the first fifty pages of the book, and he rules much of his daughter Alma’s life thereafter. He’s a trifle like a pre-modern Gatsby: an uncultured roughneck who parlays his I’ll-show-them attitude into an incalculable fortune. Do you see his story as a commentary on the temptations and pitfalls of the American Dream? A: I didn’t intended for Henry to be a commentary on the American Dream, to be honest …partially because I don’t totally see Henry as American, and partially because I don’t see his trajectory as being tragic in the manner of Gatsby. Henry doesn’t have enough self-doubt or self-awareness to be a tragedy, and he never really fails, either. There is nothing he longs for that he does not achieve—except immortality, of course. I see Henry more as a countryless force of nature, as a creature who is, from birth to death, comprised of pure and unstoppable will. It was exhilarating for me to write Henry Whittaker, because he is so huge and relentless and shameless. It was so fun to write of his galloping ascent and his stubborn endurance. He’s the power source whose energy fuels the whole first half of the book. I think of him like the booster rocket who eventually thrusts Alma out into the stratosphere. Yes, he is domineering, but he also loves and challenges his daughter, and without the example of his ruthless might, Alma could never have been the force that she turns out to be. Q: Your heroine, Alma Whittaker, may be one of the most fully developed characters in all of American fiction. Were there real-life nineteenth-century women to whom you referred in creating her? A: I looked closely at the lives of such women as Mrs. Mary Treat (a New Jersey–based expert on carnivorous plants who was a correspondent of Darwin's), and Elizabeth Knight Britton (a respected moss expert who founded the New York Botanical Gardens along with her husband), and Marianne North (a wonderful and fearless botanical illustrator who, like Alma, set out alone to explore the world quite late in life) . . . and many more besides! In the nineteenth-century, botany was considered the only science that was truly open to women (flowers and gardens being “feminine” topics, you know) so I found no shortage of brilliant and tireless female researchers from whom to draw inspiration for Alma’s work. Emotionally, though, Alma is my own creation. From the very first page, I simply felt that I knew her in my bones, and that I had an obligation to tell her story as honorably and thoroughly as I could. Q: Alma’s great passion is for botany. You yourself were raised on a tree farm. Like Alma, you had a childhood with few neighbors and a lot of books. What other similarities between you and Alma might it benefit readers to know about? never permitted me to wallow in my sorrows. (Though my mother is infinitely more affectionate than Beatrix.) I also had, from earliest childhood, an instinctive thrill of learning, and was always exploding with curiosity. I also grew up without friends and neighbors nearby, in the isolated bubble of my parent’s farm. As an adolescent, I was also tall and ungainly, and I longed for male attention that I could never hope to receive. And as an adult, I have also sought (and found) deep refuge and satisfaction in my work—especially at times when my personal life may have disappointed or hurt me. This last bit is really what Alma and I most share in common. The name Alma itself means “soul,” and in this regard (her lifelong passion for her work) Alma is indeed my soul. Q: For each of the friends, marriage turns out to be, to one degree or another, a catastrophe. You have reflected a great deal about marriage in your other writings, especially in the memoir Committed. What do you think your characters’ errors might teach us about the rather tricky business of matrimony? A: I think, to be honest, the depiction of their marriages is a bit more realistic and accurate than the model that most romantic novels would have us believe! I didn’t intentionally set out to make these women suffer, but I wanted to show what would really and truly have happened in these mismatched unions. None of their husbands are bad men (in fact, there is not a villain of any kind in the entire novel) but they are simply not the right fit. We all know that this can happen. Poor Retta Snow is the only one who is really undone by matrimony (though I suspect her mind would have unraveled over time anyhow, no matter whom she had married.) Prudence and Alma both survive their marriages with dignity. As their mother teaches them early on, dignity is the only thing that matters, and time will reveal who has it. I feel proud that, by the end of the novel, they both have earned their dignified lives. Q: Your novel looks at nature in search of something like divinity. Your observation that moss “is a resurrection engine” typifies this quest (p. 169). Can we find God in the physical world? A: Well, people sure used to think so. Up until the middle of the nineteenth century, men of science were all believers. Most of the great early English naturalists were also ministers; they were the only ones who had education and leisure for such pursuits. Darwin himself almost became a minister. God’s power was always thought to be most easily and obviously revealed in the majestic works of nature. (I think we still instinctively feel that sense of awe and humility when we are faced by nature's wonders.) The problem came when the scientific evidence began to contradict the biblical record. We must never forget how painful this schism was—and remains—to the deeply devout. As early as 1850, you start to see people having to choose sides, and this choosing seemed to tear something vital out of everyone. Now we live in a world full of scientists who live without divinity, and believers who live without science. I feel something has been lost here—reverence on one side, rationality on the other. I hope my book speaks to that loss. And I love giving the last chapters of my novel to Alfred Russel Wallace, who was a great evolutionary scientist, as well as a believer in the notion that there exists in the universe some “supreme intelligence” who calls to us and longs for communion with us. Wallace saw no inherent contradiction in these two ideas, and he died a happy man. A: Absolutely nothing! I am resting. I am deeply at rest. This book was a long journey and I think I may have to catch my breath a bit before launching into another. THE SIGNATURE OF ALL THINGS follows the fortunes of the Whittaker family as led by the enterprising Henry Whittaker—a poor-born Englishman who makes his fortune in the South American quinine trade, eventually becoming the richest man in Philadelphia. Born in 1800, his daughter Alma becomes a botanist of considerable gifts herself. Lonely and misunderstood, but also brilliant and intensely curious, Alma studies the humblest forms of plant life, unwittingly embarking on a path of inquiry that will lead her to the darkest mysteries of evolutionary theory. On the way, she falls in love with Ambrose Pike, a gifted artist whose idealism and spiritual light attract her like a moth to a flame. Body clashes with spirit and science intertwines with religion as the two unlikely lovers journey toward their strange and improbable destinies. Exquisitely researched, THE SIGNATURE OF ALL THINGS soars across the globe—from London to Peru to Philadelphia to Tahiti to Amsterdam, and beyond. Along the way, the story is peopled with unforgettable characters: missionaries, abolitionists, adventurers, astronomers, sea captains, geniuses, and the quite mad; all bearing witness to that extraordinary moment in human history when all the old assumptions about science, religion, commerce, and class were exploding into dangerous new ideas. Elizabeth is best known, however for her 2006 memoir EAT, PRAY, LOVE, which chronicled her journey alone around the world, looking for solace after a difficult divorce. The book was an international bestseller, translated into over thirty languages, with over 10 million copies sold worldwide. In 2010, EAT, PRAY, LOVE was made into a film starring Julia Roberts. The book became so popular that TIME Magazine named Elizabeth as one of the 100 most influential people in the world. 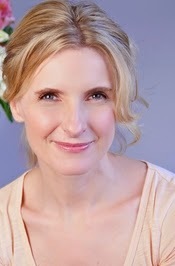 Elizabeth Gilbert lives in the small river town of Frenchtown, New Jersey, where she and her husband (more widely known as “That Brazilian Guy From EAT, PRAY, LOVE”) run a large and delightful imports store called Two Buttons. Thanks to the fabulous folks at Penguin Books, we have one beautiful paperback copy of THE SIGNATURE OF ALL THINGS up for grabs! Contest is open to US residents only. The prize will be shipped by the publisher. Bookish is not responsible for items lost or damaged in the mail.